Frost cracking represents the process of temperature strain of frozen rocks in the variable temperature gradient fields. The volumetric tensions arising due to changes in temperature of ground within the annual range of temperature variations can lead to frost cracking of soil masses. Cracking takes place on the surface and penetrates the ground forming polygons in plan (Fig. 5.4). Multiple repetition of the frost cracking process gives rise to cryogenic formations and specific features of the terrain. 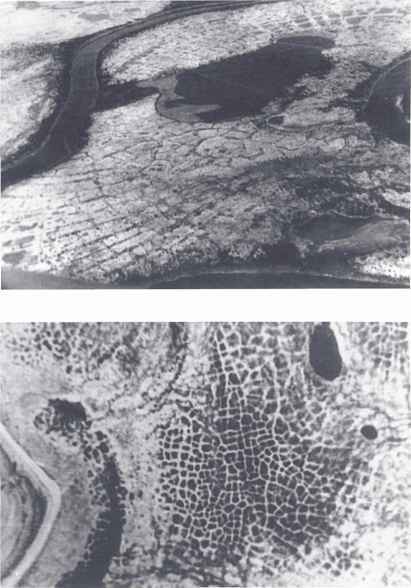 The phenomena associated with the frost cracking or Assuring process should be expressed in the size of polygons, width of fracture opening and depth of penetration, the nature of filling material and the interrelationship between the time of their formation and the time of sediment accumulation. Fig. 5.4. 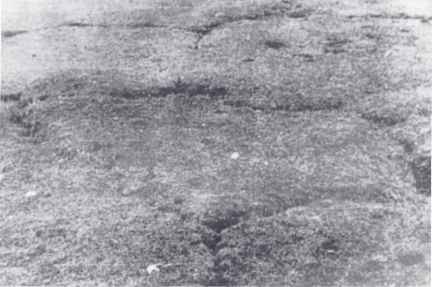 Polygons resulting from frost cracking of soils (photo F.N. Leshchikov). the surface exerts the greatest influence on the size of the polygonal grid in the horizontal plane, and the mean annual temperature of the frozen ground serves as an indicator of severity for the depth of penetration of frost fissures into the frozen ground. The greater the amplitude of temperature variations the smaller is the distance between fractures and the smaller are the polygons. Therefore, under conditions of drastic and deep freezing of ground in winter, typical of extremely continental climate regions, there arise numerous frost fractures spaced at 0.5-2 m to 10- 12 m. In conditions of less continental climate, frost polygons are formed, with cracks spaced at 2040 m (Fig. 5.5) and even 50-80 m. The finest grids on the surface are formed at mean annual ground temperatures equalling or approaching 0°C. In ground homogeneous with respect to composition (and mechanical properties), rectangular fissure networks are formed, whereas in heterogeneous ground the networks have a complex pattern, conjugating with each other at right angles. Polygons having four, sometimes five and more, sides can be formed in this way. Fig. 5.5. Polygon-dike topography within the limits of high flood-plain: a the Algan river of the Anadyr river basin (photo A.N. Kotov), b - the Gydan peninsula (photo G.I. Dubikov). temperature of perennially frozen ground the deeper the elementary cracks penetrate. Frost fissures can reach 5-10 cm in width at the surface. As a rule, the frost fissures are filled with water, fine soil, sand, peat with the formation of polygonal-wedge structures which are subdivided into four types: recur ring ice wedges, original ground wedges, primary sandy wedges and pseudomorphs replacing recurring ice wedges. Frost cracks (fissures) are formed in winter. In the spring these cracks are filled with snow melt water which freezes, and elementary ice veins are formed in the frozen soil. In the layer of seasonal thawing the upper part of the vein thaws in summer, while in the underlying perennially frozen ground the ice vein is preserved. This is possible provided the depth of fissure penetration is greater than that of seasonal thawing. From year to year frost cracking is repeated at the same place; the cracks formed are again filled with water which freezes, each time. This is the way elementary ice veins are formed embedded one into another, promoting expansion of the ice wedge (Fig. 5.6). The structure of an ice wedge shows a vertical banding: vertically oriented air bubbles and inclusions of mineral particles such that the elementary ice veins can be distinguished. Their number corresponds to the number of years during which an ice wedge has been forming. Usually, it takes thousands of years. The deeper the frost fissures are and the longer the time of their growth, the larger is the width and vertical dimensions of the ice wedges. Further northwards, as the climate becomes more severe, the rate of growth of the ice wedges is quicker. The growing ice wedges displace the ice-bearing soil. Around frost fissures there are ridges on the ground surface, while above the wedge itself (between the ridges) trench-like depressions are usually formed resulting from thawing out of ice wedges within the layer of seasonal thawing as well as due to erosion processes. The so-called polygonal-ridge pattern of microrelief is formed. The recurring ice wedges are found both in ground formed earlier under more severe freezing conditions, and in ground where the accumulation of deposits is proceeding. The former are named epigenetic, the latter, syn-genetic. The latter are the deepest polygonal wedge formations, reaching 40^60 m and more in depth and 6-8 m in width. Epigenetic wedges, as a rule, do not exceed the thickness of the layer of annual temperature variations. The recurring ice wedges form on sandy-silty, silty-clay and peaty sites of deposition terrain (river valleys, lacustrine basins) that are periodically covered with water, with mean annual temperatures below — 3°C. The further north they are, the more widely they develop on gently sloping hillsides and on interfluves, and they are encountered even in the eluvium. Fig. 5.6. Syngenetic ice wedge, up to 0.5 m wide, in the Pleistocene alluvial deposits of the Maya river of the Anadyr river basin (photo A.N. Kotove). wedges, in the layer of seasonal thawing and freezing of the ground. In the spring the frost cracks are filled with liquified soil and not with meltwater. In the north these are rarely encountered, being found only where there is comparatively deep thawing. Southwards such sites are substantially more extensive. They are also encountered beyond the permafrost region. In conditions of severe and very dry climate with strong winds in winter, when frost cracks are formed sand fills them and small sand veins arise. Multiple repetition of the process results in the formation of sand wedges. Certain conditions can promote formation of sand-ice filled wedges. Sand-ice wedges and sand wedges also form in less severe conditions than those of the Antarctic continent: in Central Yakutia, in the north of West Siberia, etc. At positive or negative mean annual temperatures near to 0°C, when frost fissures do not penetrate below the seasonally frozen or seasonally thawed layers, the sand wedges occur entirely within the depth of these layers. Pseudomorphs of recurring ice wedges are secondary formations resulting from thawing of ice wedges and refilling with soil (Fig. 5.7). They are mainly encountered in such areas where recurring ice wedges thawed as a result of local or regional degradation of perennially frozen ground. They are observed to be widely developed beyond the limits of the regions of the recent permafrost: in the Ukraine, Poland, the former Czechoslovakia, Mongolia, China, etc. Within the limits of the permafrost regions they can be observed on sites where ground ice thaws as a result of thermokarst development or thermal erosion. They are frequently developed in the bottom of the 'dry' alases of Yakutia. Pseudomorphs of ice wedges are of great importance in the study of Quaternary deposits, elucidation of the history of permafrost strata and reconstruction of the palaeographic setting of the past. Small polygonal forms of relief are also widely developed within the permafrost regions. 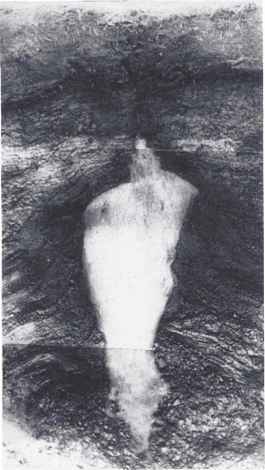 They form under the influence of a variety of processes. First of all, this is associated with small polygon shapes of cracking and formation of closed (enclosed) systems of thawed ground in the layer of seasonal thawing when nonuniform freezing occurs from the top and laterally. In such systems hydrostatic pressure increases greatly, promoting transformation of thixotropic wet soil within blocks into a plastic-flowing state. Often, a surficial frozen crust is broken, and the liquified ground mass flows out onto the surface (Fig. 5.8a). Along with this an oriented heaving of stone material can occur (see Fig. 5.8b). These processes repeated many times result in the formation of 'spot medallions' and 'stone garlands'. Such shapes are widely developed in the north. Their dimensions vary between 0.3-0.4 to 1-3 m and more, they are mainly developed in the seasonally thawing layer in sandy-silty - silty-clay soils. On the depositional plains they take the form of 'spot medallions'. In the regions with a shallow cover of loose deposits enriched in stony material, 'stone garlands' are developed predominantly.